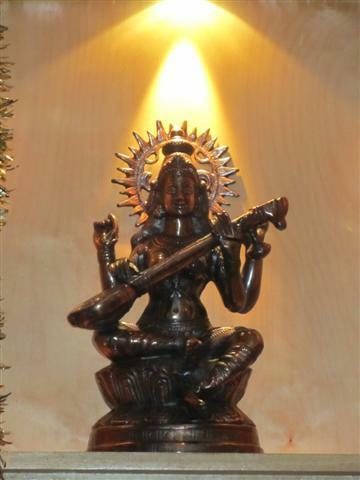 Sagar is a south Indian vegetarian restaurant. It has always looked busy whenever I have been past it. It made me wonder whether this was because of its central tourist location or if it was due to its food. It was nice to discover that it was more the latter. 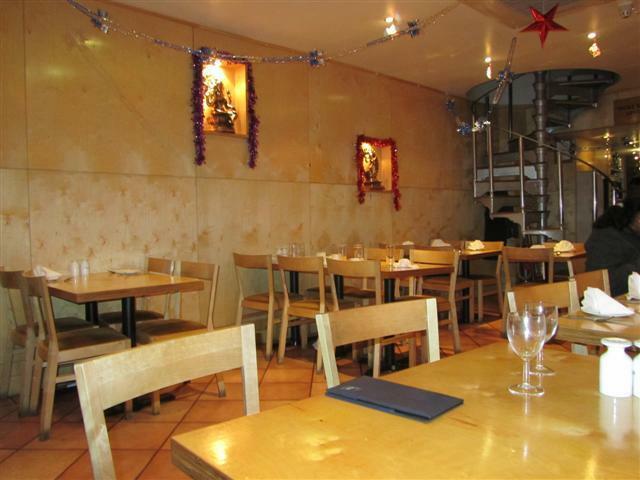 Even though it was late lunchtime, the restaurant was busy and it was good that we had booked a table. The dining area is quite small although I am not sure if there is also an upper level. Light wooden tables and chairs matched with the light walls and flooring. Some of the tables are just that little bit too close together. The alcoves on the walls contained small statues. The staff were friendly and gave us quite attentive service. It was fairly easy to get their attention when we needed anything. The Idli were steamed rice dumplings and came as a portion of two. They were a lot bigger than expected. 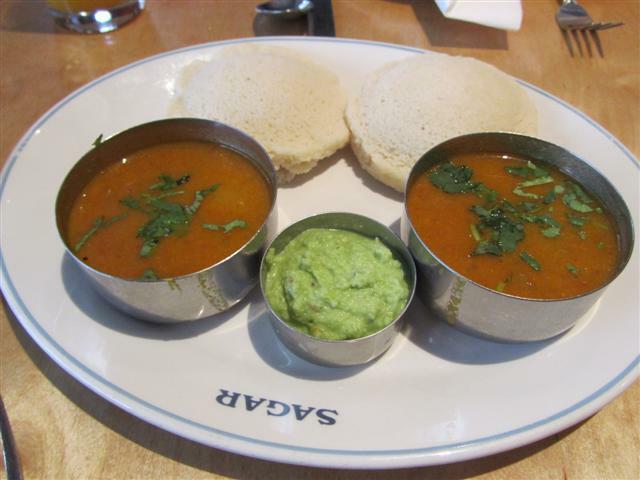 The Idli were served with sambar and coconut chutney. The soft, pillow-like Idlis were delicious with the accompaniments. The Special Upma was really moist and very moreish. It is usually made with semolina. 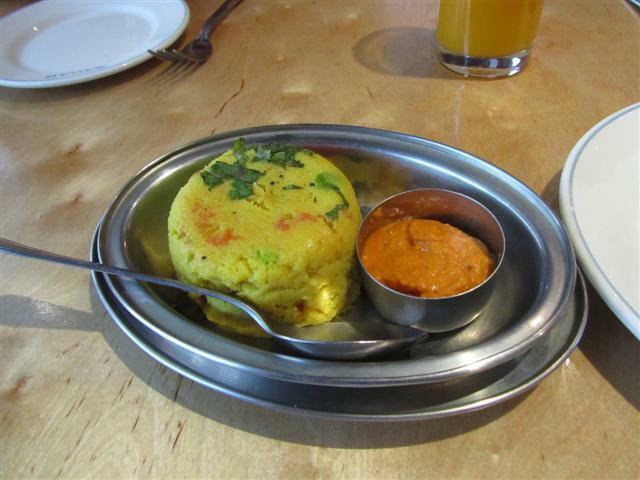 Sagar’s Special Upma was made with the addition of fresh tomatoes, cashews, peas, coriander and this came with a spicy chutney. Even though we had Idli for the starter, we still felt like dosas for the mains. 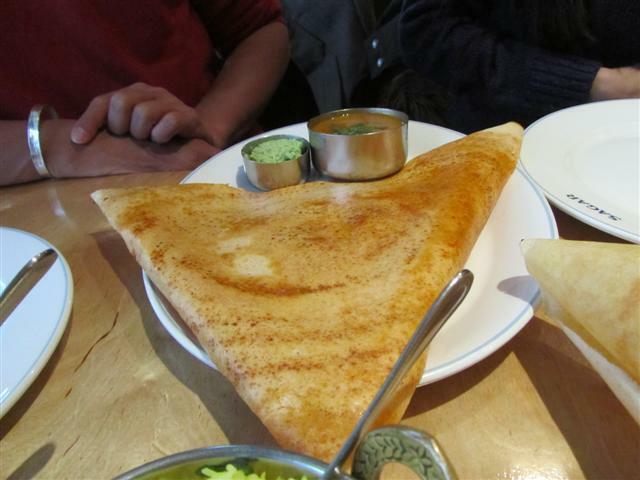 My friend really wanted the Paper Masala Dosa as it is not readily available in her country of residence. 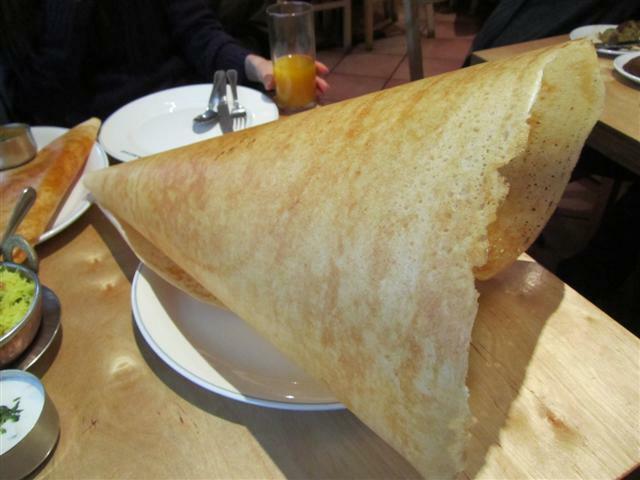 The Paper Masala Dosa came as a huge crispy cone! It was lucky that we sat at a table for four people so that we had the space for it. 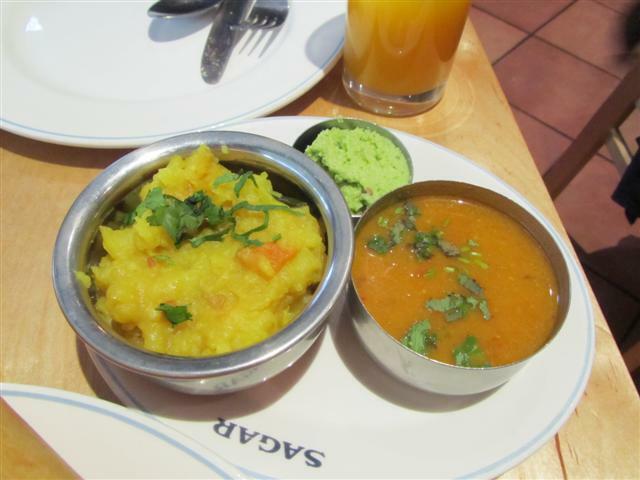 The mashed potato, onion and carrot filling was served on the side together with sambar and chutney. The other dosa that we had and it was easier to handle was the regular Masala Dosa. This was served as a folded triangle and came already filled with the potato, onions and carrots. 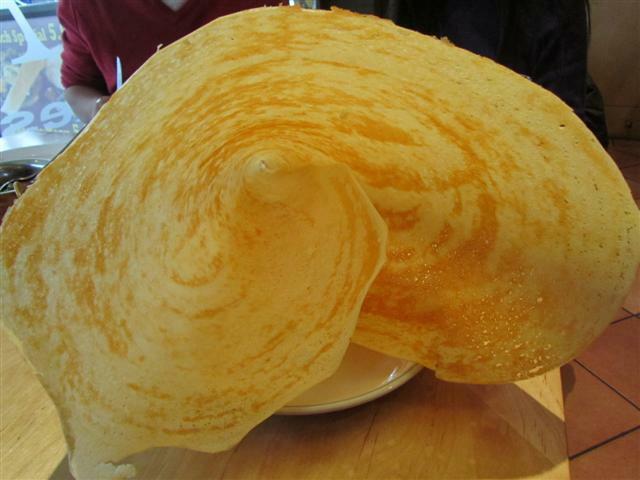 Both the dosas were made from rice and lentils. They were equally tasty and even though they were big, we managed to munch our way through them! For a bit of variety, we also had some rice and curry. The Brinjal Bhajee was a great dish made with aubergine, red and green capsicums and tomatoes. The vegetables were chunky and the delicate spices brought the whole dish together. Instead of plain rice, we had the Lemon Rice. This rice was made with peas and lemon juice. 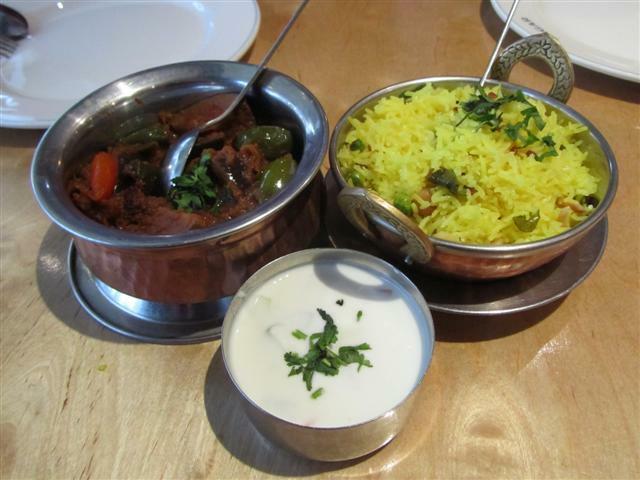 Having yoghurt with curry always works well and it was good that we had Raita with the meal. Sagar gave us good quality, fresh tasting food. They have some good lunchtime offers and also on their menu is classic Thalis which gives you a complete meal with all the different dishes!